The next best thing to live? I receive quite a few e-mails that inform me about bands playing live around town, but today I got a new one - an e-mail telling me about a band not playing live. Instead, the message detailed a "virtual concert experience" in which bands tour hi-definition, life-sized video screenings of recent live performances at venues across the country. 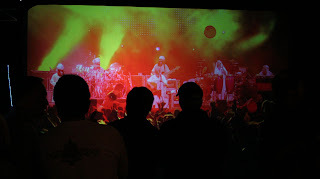 One such band is The String Cheese Incident, which fans will be able to watch - not in the flesh, but via a screening of a recent three-hour and twenty-minute live show - at Joe's Bar on 940 W. Weed Street on Thursday, September 11. Tickets are $10. Virtual Venues Network is behind the virtual tour, which includes screenings in 60 cities through mid-October. "With the recent overhaul of the recorded music industry and an increased emphasis on touring, artists are looking for new ways to reach their fans," VVN CEO Michael Horne said. "Virtual Venues Network provides a controlled environment where the artist can deliver a quality performance directly to midsize clubs and college venues and get paid for every show. It's the next best thing to live; it's life size, on stage with great sound, cold beer and a dance floor." The performances aren't available on DVD, online, or anywhere else, so this seems like a unique way for fans in areas that bands tend to skip over while touring to be able to get the next best thing to a proper live show. What do you think? Would you go to see a "virtual concert"?